Most small presses don’t have big marketing budgets to throw at every title. At most, an editor's already stretched schedules might allow her to send some postcards or make online announcements. This means a small press writer might find herself wondering how to best promote her latest book. Most editors will say that readings sell books and they are right. But how do you plan a series of readings? Where do you get the money? How do you travel and how far? Where does a rookie begin when planning a book tour? release at Copacetic Comics, in Pittsburgh. photo by Mark Knobil. I decided to answer these questions by reaching out to novelist and seasoned book-tour-planner Karen Lillis. 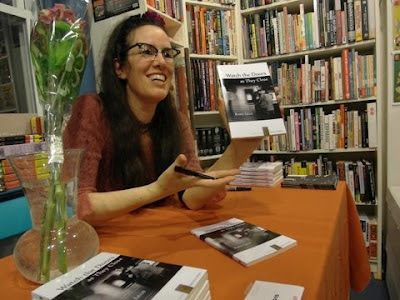 Lillis is currently in the middle of her second book tour for her fourth novel, Watch the Doors as They Close (Spuyten Duyvil Novella Series, 2012). In 2000, Lillis embarked on the cross-country "United States of Amnesia" Reading Tour via Greyhound bus for her first book, i, scorpion (Words Like Kudzu Press, 2000). She's read for many a reading series in the United States and abroad, including Kilometer Zero (Paris), Experiments & Disorders, (New York), The Five Ten Readings (Baltimore), The New Yinzer Presents (Pittsburgh), among others. Also a freelance writer, small press advocate, and Pushcart Prize Nominee, she writes about indie publishing and indie bookstores at Karen the Small Press Librarian. Lillis is raising funds for her current book tour on IndieGogo, which for a mere $15 donation gets you a signed copy of Watch the Doors. After a book release event on March 8th , she traveled to Cleveland and Baltimore and in late April she visits New York, Philadelphia, and returns to Baltimore. I caught up with Karen between tour legs to chat about her experience with planning and carrying out a successful book tour. Check out the interview followed by the promo video for her IndieGogo campaign. For your first novel, i, scorpion (Words Like Kudzu Press, 2000), you traveled cross-country. Did you plan this book tour? If so, what did you learn from that first experience and how did you apply it to planning future book tours? Yes, I booked that cross country tour. I traveled with a Greyhound 6-week pass, stayed in cities where my friends lived, and booked readings by looking at local listings and figuring out where people held literary events. Things were very different then—this was 12 years ago. I was using online newspapers to help me find reading venues, but the social web didn't exist. I was still young as a writer and most of my friends were artists or else the kind of writers (journalists, screen writers, zine writers) who didn't do readings; I didn't know many "performing writers" yet. So I made things up as I went. I was emboldened by the DIY ethos of that time (2000). Some things I learned for sure: When booking, pay attention to WHO is reading where, don't just go for the generically "good" venue or bookstore, but look for a good fit. Don't read alone in a far-off city—always read with a local who has a local audience. Don't assume anything—check in with your venue a few weeks and a few days before your event. Do your own publicity. If there's a blizzard, don't be afraid to reschedule the reading. Take your reading seriously, but don't take yourself too seriously. By “take your reading seriously” I mean, prepare yourself and figure out what you need to do to give a good performance—preparation for me includes picking out the right reading selection, practicing and timing it beforehand, and choosing the right clothes. By “don't take yourself too seriously” I mean, don't forget that no one except you really cares if you keep writing, keep reading, keep publishing. Do a book tour to see other places, meet other writers, see what it’s like to read to a room full of strangers, fall on your face and find out what you do after that. Do a book tour to see what you’re made of. Everything else (feedback, book sales, reviews) is icing. Lastly, I learned that you must entertain the audience. My new book, Watch the Doors As They Close, is a very introspective book that I think lends itself best to an intense, private read. My first book tour was with a novel that had some great extroverted chapters—flamboyant characters, dialogue, diatribes. It made for obvious readings. For this book, I am combining excerpts from the book with outtakes in order to lure the audience in with something funnier, and then get to the more introspective passages once they are paying attention. Did you set up all the readings for Watch the Doors As They Close before starting the fundraiser on IndieGogo? I set up several readings before the IndieGogo campaign, but it's not necessarily the end of the "tour" —I'm going to try to add more readings in 2012 if money and vacation days allow. But for IndieGogo or Kickstarter, you have to have something concrete to campaign for—so, yes, I had seven readings set up before I started the fundraiser. What back up plans did you have if you didn't meet your fundraising goals? I am keeping a budget and trying to raise the money one way or another to pay for the book tour above and beyond my usual life expenses. So, back-up plans include taking on some articles for extra income, selling off some signed first editions, and crossing my fingers for a good tax rebate. And of course the credit card is the ultimate back up plan that I'm trying to avoid. Since this is your fourth novel, you've obviously done a lot of readings. I'm guessing you also have a lot of connections in the indie bookstore world. Did you have previous relationships with your reading venues or did you contact them cold? I don't think I ended up cold-contacting anyone for this tour so far. I did a lot of that in 2011, though, when I was setting up reading dates for a poet whose book I published. I really enjoyed doing that because working on his behalf took the ego out of it; I could just advocate for him and not have any self consciousness come into the equation. I learned a lot and made some good contacts that way with bookstores, reading series, reviewers, and some other writers. For this Watch the Doors book tour, I often started the process by contacting a writer I wanted to read with and they had a contact at a local venue. In Baltimore I got to read again at a great series where I read my last novel (the 510 Readings). Any tips on setting up readings for newbies? For young writers, I would advocate using your social web contacts and trying to set up readings with writers whose work you like or with whom you have some kind of personal connection. Reach out and see if they'd be interested in reading with you. Be ready and willing to do all the leg-work to set up an event, but don’t be afraid to approach other writers or to ask questions. Go to readings and pay attention—what makes readings enjoyable and what detracts? If you’re cold-contacting a venue (I suggest by email), let them know why they would want to host you. How are you going to bring them an audience? How are you going to entertain the audiences they already have? If you’re reading at a bookstore, don’t balk when they take a cut of your (chap)book sales. That’s their business—expect a 60/40 split (you get 60%). On your fundraising page, you talk about the goal of "building an audience" for Watch the Doors. You also mention selling copies to audience members. Can you tell us about the success of these goals? How do you know if you are building an audience? Is that the same as selling your book? These are good questions, and not necessarily easy ones to answer. Building an audience is not the same as selling your book, no. Right now my definition of building an audience is doing my best to give readings that communicate to an audience, and being prepared to do this over and over (over space and over time). My work is also to seek out venues that might host audiences receptive to my writing in particular. My Cleveland reading is a good example—I set up a reading there with a writer, Mike DeCapite, whose new prose chapbook blew me away. (See my review of Creamsicle Blue here.) The reading space Mike chose made me feel very comfortable. The Lit Café was a cozy neighborhood bar that caters to artists. So, I felt very free to be myself as a writer, I felt very welcomed, and I gave a very unguarded reading—it wasn’t a competition and I didn’t feel “nervous.” The audience was incredibly receptive during my reading—they were warm and very emotionally “there,” they laughed at my most subtle jokes, their faces were enrapt—I could see their reactions as I read. But this was well set-up—I was benefiting from my co-reader’s labor. Mike has been reading at this bar for 20 years, once or twice a year when he returns to his hometown from New York. So, this was an audience he had built and perhaps for the same reasons that Mike and I really admire each other’s writing, they really liked my reading. They didn’t buy many books—sometimes bars can be bad places to sell your books because you’re competing for beer money!—but I think the work of building an audience means giving a reading that’s memorable enough to stick with exactly those audience members who don’t walk away with your book. Maybe they’ll look it up later, maybe they’ll come back for the next reading I do in Cleveland. Maybe they won’t do either but they’ll remember one image in one chapter I read. It’s still my job to do the best reading I can do. I think the process of building an audience includes keeping your ego in check and remembering that these people are your audience whether they purchase a book or not. I sold a lot of books when I read in Pittsburgh, and that’s a nice feeling. But when I think about it, there were people who were really into the reading who didn’t buy a book—the two are not the same thing. After doing all these readings and working in bookstores myself—how, when, and why a book sells or doesn’t sell is still a total mystery to me. This is really useful stuff, especially for a youngish writer like me who has only done a few readings before but wants to branch out. Good interview too. Thanks, Katie! It took me a while to figure out that you have to ask curators if you can read for their series. Sometimes you'll be invited, if you have a friend who curates a reading series. Even then sometimes you have to bug your friends! Don't ever be afraid to ask though. Glad you enjoyed the interview.